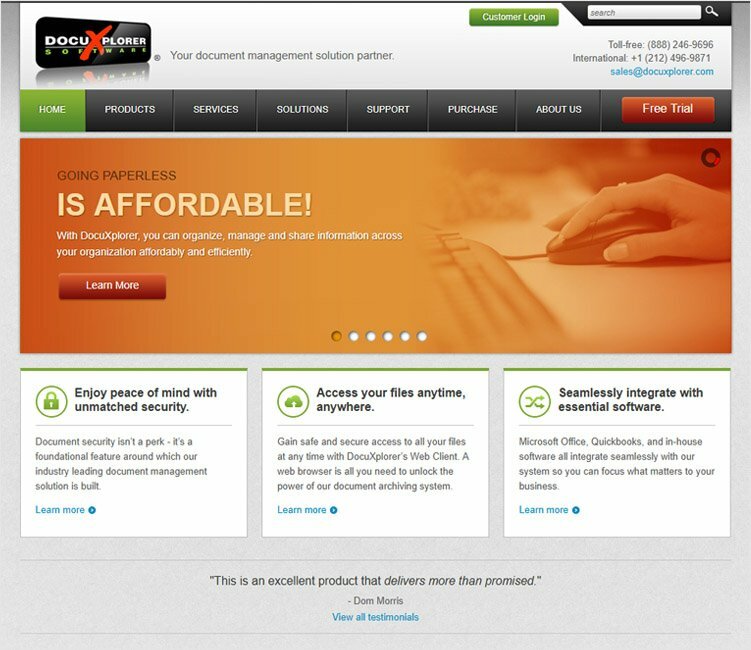 Are you looking for some of the best document management software? Documents are created for various reasons in an organization. In conventional document management method, it always uses to create hard copy and store in a specific location which can use when required. But this method has a number of disadvantages when the number of the document in the collection increases and time going on. Some of them are listed as follows. Changes of the document not easy to do. Difficult to find the difference of each document version. The requirement of document management system comes to overcome these issues and the following list is the identified 10 best document management software available. 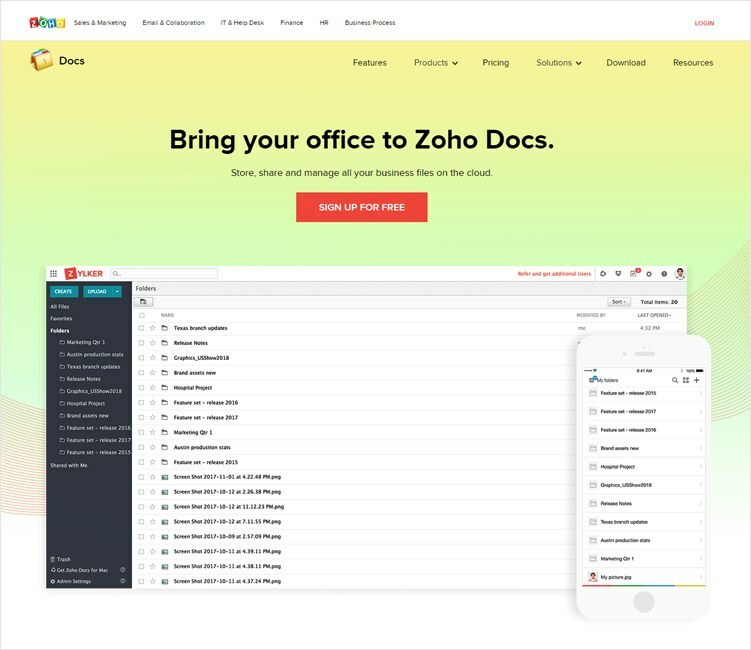 The DOCS application created by ZOHO is cloud base document management software that facilitates to create, Store, Share, collaborate and manage documents. The store created the document in a cloud and there is nothing to worry to carry them to different locations. Simply it can access from anywhere. Multilevel folder structure allows organizing the document storage in clean way. Compatible with all the devices like PC, Mac or mobile devices and documents can access from all of those devices. Possibility to share the document as links and no need to send as email attachments. Sharing links can create with password protection and expiration dates to make the document are only with secure hands. Possible to use with documents, spreadsheets and presentations. Facility to chat when creating document in a team work. Strong access control system that can implement on inside or outside users. Manage documents with popular cloud service providers like Drop Box and Google Drive. 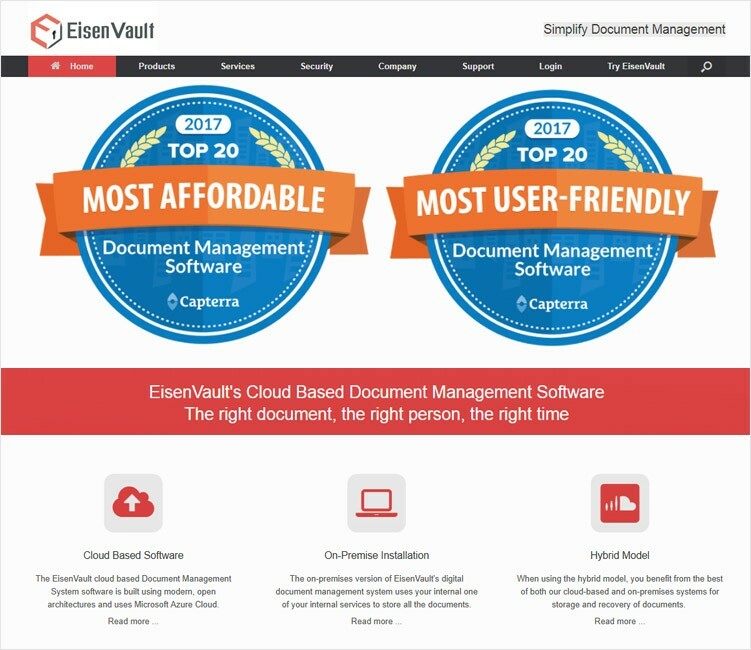 EisenVault is to ensure right document available right time with the right person. It is cloud base application. Digital document storage facility with the online editing facility. Possibility to include document related Meta data such as created date, Author and user name. Searching facility with indexing on document. Multi language support for documents. Well established secured servers for cloud storages. Enterprise level advance document encryption method for ensure security. Daily database backup to ensure document security. Unlimited file size for the documents. Access through web and mobiles apps with all device compatibility. Customizable user interface to make sure company identity is with the application. 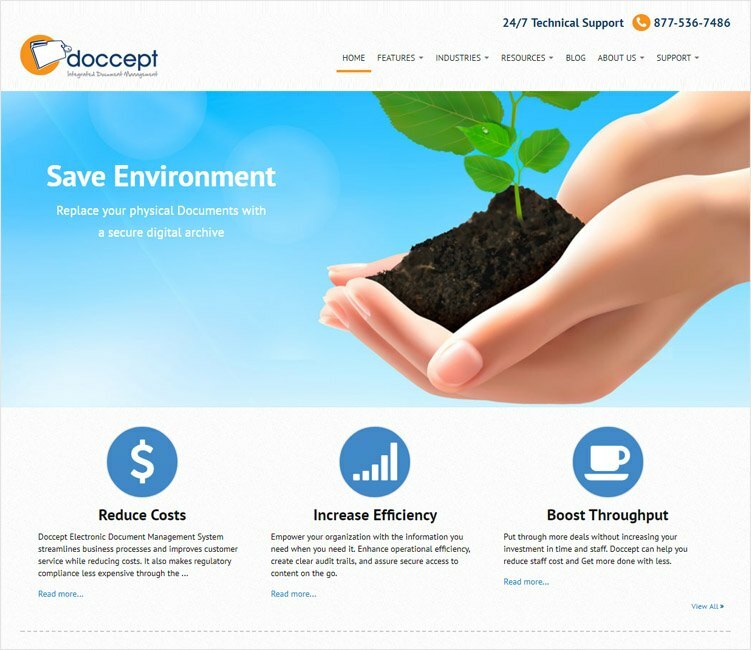 Doccept is a multi-user document management system which facilitates all the following features related to document management and streamline the process of the business that promotes more efficient services. 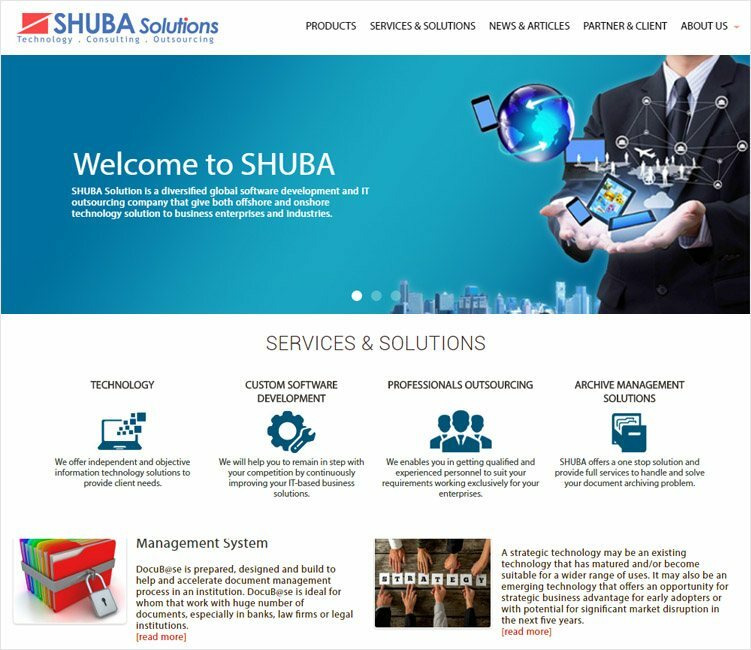 Created latest web development technologies and possible to access through the web. Simple and user-friendly interfaces with highly customizable possibility. Simple installation and configuration steps with highly configurable functionalities with minimal requirements for training. Administrator user has the possibility to control usage quota per user. The single sign of facility. Possibility to integrate scanner directly to the application. MS office and Open office integrations. Administrator dashboard to monitor system activities. Company specified templates can create and store within the tool to use in general document creation works and also help to maintain unique document format. Facility to redirect emails to specific folders and folder structure can define for document storage. Easy document upload facility by drag and drop option. Multiple selects option to upload several files. Preview available for up to 100 document formats and also the possibility to preview AutoCAD files. Subscribe facility to a document a notification will go to subscribed users when change done. Possibilities add and read comments on each document form other users. When document review request is available, it will notify to relevant group or person in advanced. 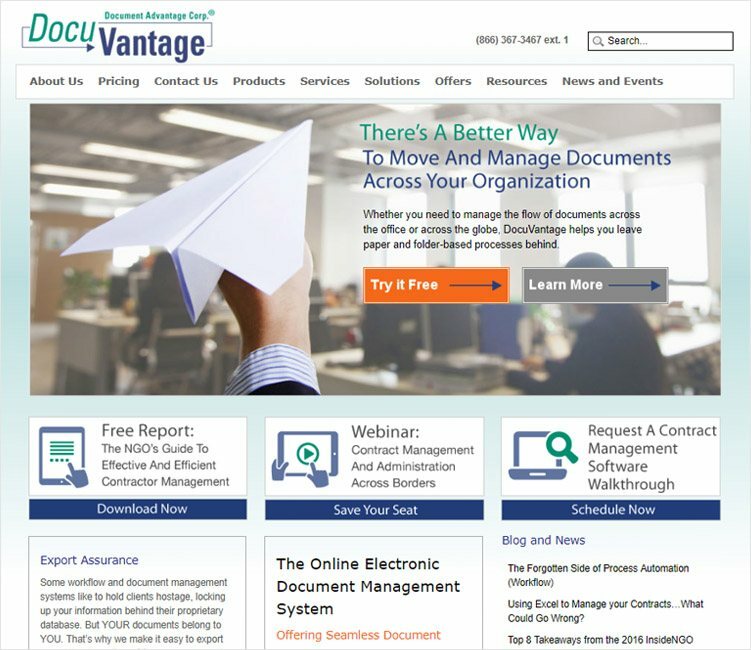 DocuVantageis document management software comes with modules that facilitate Document Capturing, Imaging, Text search, version control, Archiving, optical character reader, Annotation, Redaction and Collaboration. Fully access to the office workers and to the remote workers. Web based scanning facility to simplify the remote document capture with interfaces to ProKofax and EzeScan. Dra and drop facility from computer to archive folder. Batch import facility for large number of documents. Full text based content search for existing documents. Define indexes for increase document searching speed. File preview option with automatically detect and launch in base application. Cross folder search facility in different archive folders. Access control using multiple level of security permission and also the possibility to define permission on document or folder level. Color specified comments to indicate type of comment for each document. 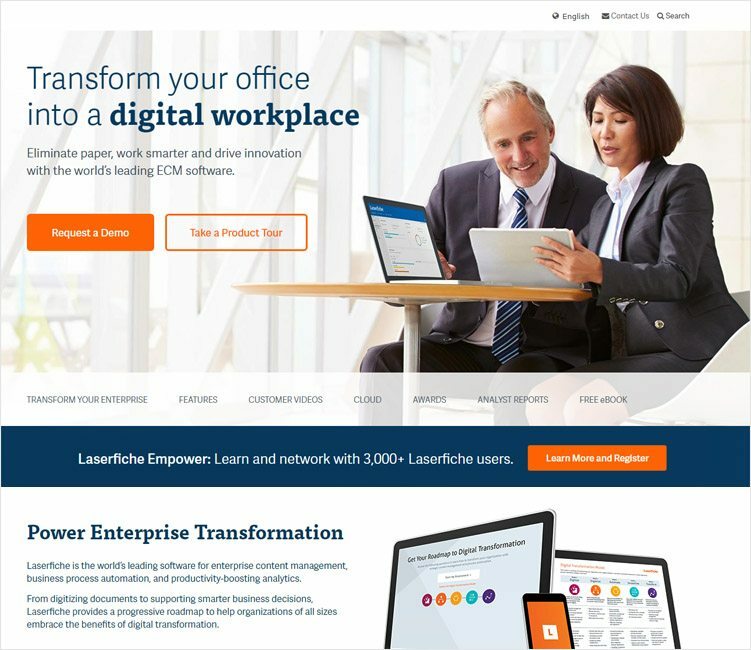 Laserfiche is a document management system that helps to enhance company workflow and increase the performance. Easy to find the document from the organized folder structure with a search option. Also, business process related document search exist. Possibility to duplicate existing folder structure with easy steps. Possibility to hide sensitive details using inbuilt redaction tool. Sticky notes facility to add notes to existing documents. Possibility adds personnel stamps to the document when there is a special action need to the document. Compatible to all operating systems and all mobile devices. Comes with the one-time payment plan. Cloud based or Software as service availability. 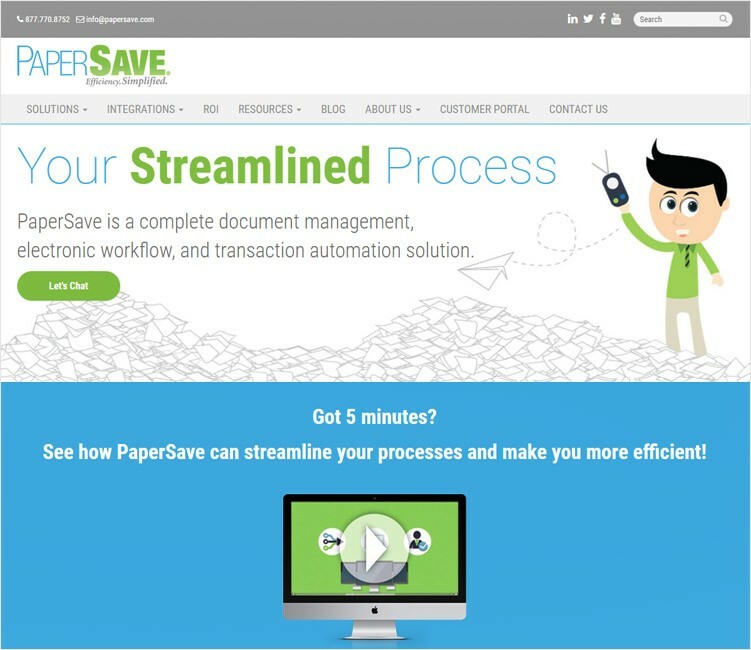 PaperSave is a complete document management system with electronic business word flow and transactions. Following features of PaperSave help to improve the business performance and also reduce the material cost in paper works. The direct scan of the documents to the system with the single click and also feasible to automate the scanning process of document stack using scan later option. Integration with MS outlook captures email and attachments, enter them into workflow or associate with existing documents. MS office integration facilitates to add any type of created document using office package to enter into the workflow. Drag and drop option make easy to enter documents to the system. Option to right click option from any supported file type and add into the system. Content search allows searching the information on the document. Structured and unstructured document search facility. Cloud storage to save documents and it will help to access the entire document from any location. [email protected] was created to help document management process when a large number of the document available and it also accelerate document related works. Facility to categorize documents on any of the predefine categories. Possibility to define access control with the permission set for each category. Advanced search option for catalogues. Possibility to define specific user groups, set of attributes and profiles for each category. Facility to define expiration dates for the documents and email/screen alerts on expired documents. Facility to define document workflow. Customizable search options that can design according to the company requirements. Integrated to MS office package. DocuXplorer is document management software specially designed for the small and medium range businesses to collaborate between departments of the company. The system comes with all the functionalities that are used in large companies to use without the need of any technical expertise. Following features of DocuXplorer help to streamline the document workflow and increased the company performance. Direct import documents from MS office package, email, fax machine or any hard drive. Inbuilt PDF print drive can capture information from any program and store. Cabinet, drawers and folder structures help to create storage structure with sync with physical document workflow. Tags, metadata and indexes can create on documents and storages, which will help to locate document easily. Maintain the history of the document revision changes with the information on date/user who involved with the revision change. MS office integration facilitates to easy edit of MS office documents. The multilevel security system will help to prevent unauthorized access to the documents. Security measures compliance with all government required standards including HIPAA, SEC, Sarbanes-Oxley and FINRA. Built-in Optical multi-language character recognition (OCR) functionality helps to allow working with 27 languages. Facility to define document work flow according to business processes. PDF conversion and rapid backup mechanism can be configured. 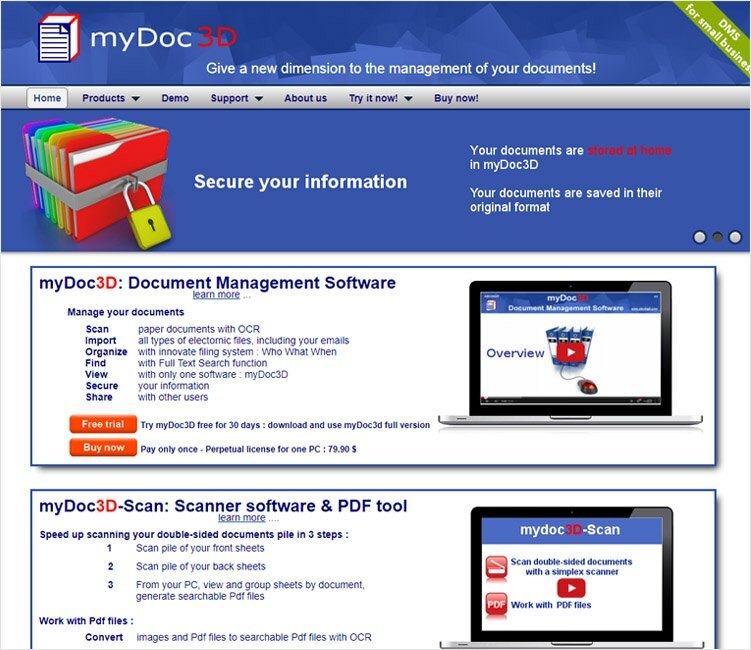 myDoc3D is a document management software which is suitable for small businesses, Project teams and self-employed people.it is easy to use user-friendly system comes with following the set of features. Inbuilt Optical character recognition (OCR) facility. Scanning solutions to speed up the document adding process. Integration with Microsoft Office and outlook. Also with windows explorer. Document tagging facility using Metadata. Customizable fields and functions with customizable user interfaces. Document check in and check out facility. User level permission set creation facility for access control. Predefine functions to Email operations. Text editing facilities with real time update possibility. Full-text search and multi-condition queries that allow searching by Metadata, the version with the preview option. Centralized or distributed document storage. Free trial version for functionality verifications. 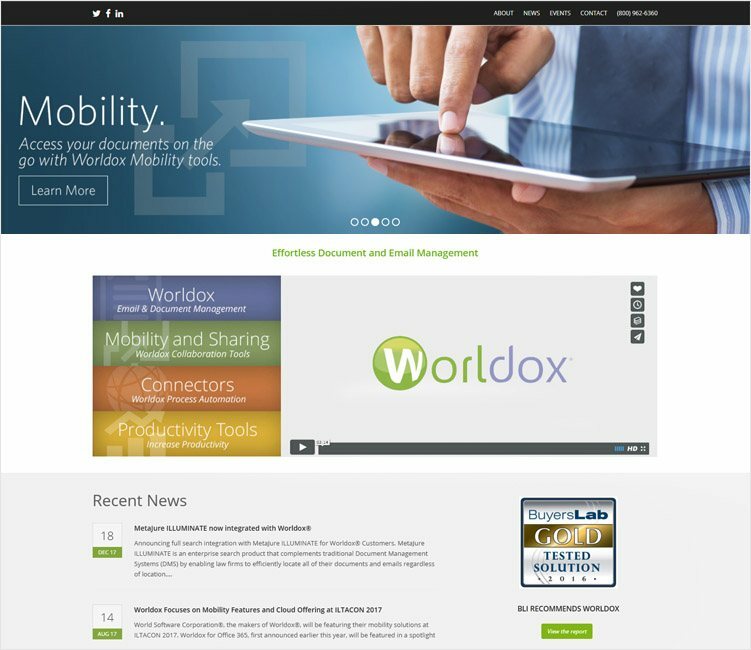 Worldox is a document management system that allows accessing all your information and knowledge quick and easy access. Simple right-click option to create industry-standard pdf file from any type of document. Quick text comparison facility to compare two documents. Possibility includes metadata for a document. Multilevel user access permission to control unauthorized access and change to existing documents. Automatically removing process to metadata when document transfer to outside from the system. Convert any type of document from PDF to MS Word format. Studies suggest that 80% of the company information and knowledge stored in unstructured data. All of above-discussed document management systems can use to store that knowledge and information in a structured way. Also in all system, there is an extra consideration to simply the document entering process and the information retrieves process.